Merry Christmas & Happy New Year from your Robot Doc–Matthew Johnson! The length of the small intestine can vary greatly, from as short as 2.75 m (9.0 ft) to as long as 10.49 m (34.4 ft). The average length in a living person is 3m-5m. The length depends both on how tall the person is and how the length is measured. Taller people generally have a longer small intestine and measurements are generally longer after death and when the bowel is empty. The duodenum is a short structure ranging from 20 cm (7.9 inches) to 25 cm (9.8 inches) in length, and shaped like a “C”. 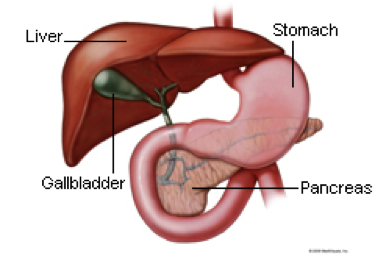 It surrounds the head of the pancreas. It receives gastric chyme from the stomach, together with digestive juices from the pancreas (digestive enzymes) and the liver (bile). The digestive enzymes break down proteins and bile and emulsify fats into micelles. The duodenum contains Brunner’s glands, which produce a mucus-rich alkaline secretion containing bicarbonate. These secretions, in combination with bicarbonate from the pancreas, neutralize the stomach acids contained in gastric chyme.